The Power of Cute by Simon May (Princeton University Press, 2019). The Moral Psychology of Gratitude edited by Robert Roberts & Daniel Telech (Routledge, 2019). Free Will and the Law: New Perspectives edited by Allan McCay & Michael Sevel (Routledge, 2019). Plato: Charmides trans. with introduction, notes & analysis by Christopher Moore & Christopher C. Raymond (Hackett, 2019). A Lot of People are Saying: The New Conspiracism and the Assault on Democracy by Russell Muirhead & Nancy L. Rosenblum (Princeton University Press, 2019). 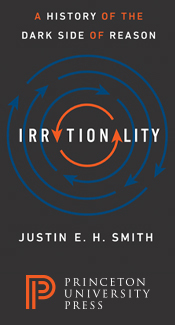 Irrationality: A History of the Dark Side of Reason by Justin E.H. Smith (Princeton University Press, 2019). How Changes Happens by Cass R. Sunstein (MIT Press, 2019). 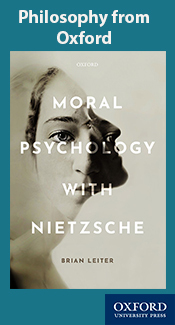 Moral Psychology with Nietzsche by Brian Leiter (Oxford University Press, 2019). Strictly for those interested in Nietzsche. 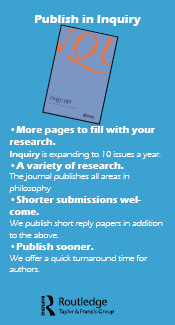 Lots of new postings at PhilJobs; if you've recently accepted a job or post-doc, post your information there. Helen De Cruz (philosophy of religion, philosophy of cognitive science, experimental philosophy), Senior Lecturer (Associate Professor) of Philosophy at Oxford Brookes University, has accepted a tenured offer from the Department of Philosophy at Saint Louis University, where she will take up the Danforth Chair in Philosophy this August. According to this rather brief news report, the defamation claim was dismissed (as expected), but it looks like his other claims may be going forward (which would make sense given that they turn on real factual issues yet to be determined). UPDATE: Several readers report that Professor McKinnon's account has been suspended for "abusive" behavior, which is hardly surprising--the only thing that is surprising is that it took so long. Of course, Twitter is a cesspool of such behavior, so they should probably delete the whole platform! ANOTHER: And now she's back (having learned nought!). This year the theme is "hermeneutics." I don't usually post announcements of summer schools, but this one--organized by my friend and part-time colleague Michael Forster and Markus Gabriel--I've participated in for several years (not this year, however), and I do comment it to interested students. The deadline for applications is April 1! Stanford Encyclopedia of Philosophy "visualized"
I'm not quite sure what to make of this, but it looks neat! Trump remains a self-serving narcissist, idiot, and incompetent, with a Mafia mentality. He's a danger to humanity. The Democrats better not screw up the next 18 months. As I wrote in the fall of 2017: "[A]cademic freedom protects Jorjani's right to be a monstrous fool; as long as he is discharging his pedagogical duties in a competent manner, his institution should not penalize him...If he has been suspended solely because of the NYT story putting a spotlight on his views, then the New Jersey Institute of Technology has acted wrongfully." Now they have terminated his employment, not simply suspended him. Of course, as the outcome of the Salaita case shows, even if Jorjani's constitutional rights were violated, his recovery may not be commensurate with the injury. ...about his new book offering an empirical-psychological defense of "armchair philosophy." ...at Richard Marshall's new website, which will soon include the archive of his past interviews as well. ADDENDUM: Richard confirm that he will continue his interview series, posting them at the new site, which is wonderful news! He has several interviews in process. Mary Warnock as case study. ..at 3:16 AM (Richard Marshall's new site for interviews with philosophers). In this context, ‘self-identification’ means that law should give decisive weight to the sincere affirmation of someone who was not formerly a woman that now she is. It matters that the affirmation be sincere, and to some extent stable, not only for practical purposes but also to reduce possible (if largely hypothetical) strategic and aggressive uses of self-identification. One option is something like the Irish model, requiring a statutory declaration and providing for penalties for abuse. But this will not resolve all the issues. I share Kathleen Stock’s view that there are deep conflicts of interest here between women and trans-women. We may be able to avoid some of them, but I’ve a feeling that there will also have to be legislative compromises. We won’t get there, however, until we can have an adult discussion of these things. Nate Sheff (Connecticut): "The grand synthesis: what goes on the gender part of your passport is whatever Les Green says." Christa Peterson (USC): "This is repulsive and DEEPLY UNSERIOUS haha philosophy is horrible!" Many readers have been writing me about Weinberg's coverage of the 3AM fiasco--in which Richard Marshall's interview with Holly Lawford-Smith was withdrawn because it offended those who "think correctly"--which may have set a new low for the ridiculous contortions required by the New Infantilism that he has long championed. I'll let a couple of my correspondents do the commentary, although they have asked for anonymity for the obvious reason that Weinberg's standard modus operandi is to feign a commitment to civility while letting the anonymous commenters at his blog dish out the insults, abuse, and lies about the disfavored. "John F Kennedy Dies Suddenly"
"Sudetenland Now Part of Germany"
Thanks for your coverage of the 3AM nightmare. Watching Justin Weinberg turn that into another occasion to lecture us about the need for interpretive charity (!! -- and "moral resisters", FML) was enough to make me want to put a fork into my eye. Despairing philosophers: put down your forks, and remember that the most salient perspectives are often not the most sensible or typical. What will (or should) universities do with student benficiaries of the fraudulent admissions? The NYT covers various perspectives, including mine. Well, not really, but funny. "Too harsh" for the Nazis!